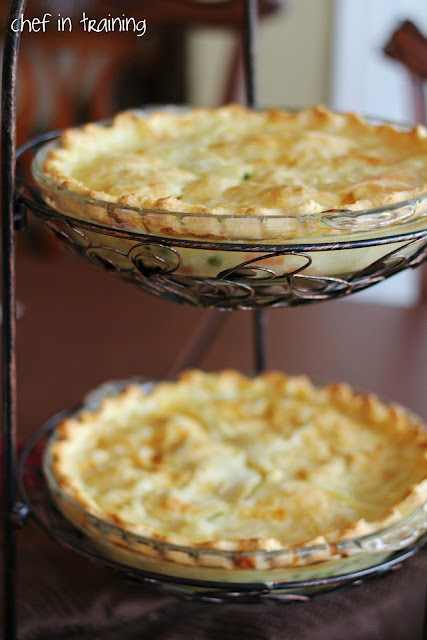 Chicken Pot Pie is a staple in my home. Talk about comfort food! The combination of flaky pie crust, creamy sauce, and hearty insides… it makes for the perfect meal. And it is an easy way to sneak in some vegetables for your kids! This recipe is my mother’s and is now one of my family’s favorite. Whenever it is a cold day and I ask my husband what he would like for dinner, he always asks for my Chicken Pot Pie! Pare-boil veggies until tender in water. Once cooked, drain. Stir in chicken. Melt butter and add flour to form a roux. Add milk and stir constantly until sauce thickens. Pour into a large deep-dish pie tin. Cut air vents with sharp scissors. Bake 20 minutes at 400° or until golden brown. Sift together flour and salt, cut in shortening. Combine egg water and vinegar. Add to flour and knead 12 times. Let stand 10 minutes. Roll out thin, top for pie. **To save on time, you can use an already made pie crust dough. My favorite is the Pillsbury brand. Looks awesome! Chix pot pie is a fav in this house! This is a top favorite in our house too!!! I love a good chicken pot pie...I will have to give this one a try too!!! I love trying your recipes. This one is next. Oh simply yum! I love chicken pot pie! Gonna be lazy and use a ready made crust~thanks so much for another great recipe! This is a pie crust recipe I've never seen before. I can't wait to try it. does it work well with fruit pies? nothing beats a go-to chicken pot pie recipe. yours looks incredible! This looks delicious. I will conquer my fear of pie crusts! This week--I'll report my success. I never make chicken pot, even I saw a lot of recipes to make it. But when I saw yours I start thinking, why not? Look how wonderful it looks...makes you have a try...!!! I am a big fan of your blog and enjoy your linky party and all the wonerful recipes on your site! Nothing like homemade chicken pot pie! YUM! Would love for you to link up and share it with us at Kids in the Kitchen: http://younglivingoillady.com/home/kids-in-the-kitchen-link-up-week-7/Feel free to link up every Tuesday, we'd love to have you. I found this on pinterest and fell in love. Your blog is great and I am so happy to be your newest follower. when you have a chance come by and check me out at Quest for Delish. I am gonna have to give this recipe a try. I love chicken pot pie but never seem to be able to make a good one. 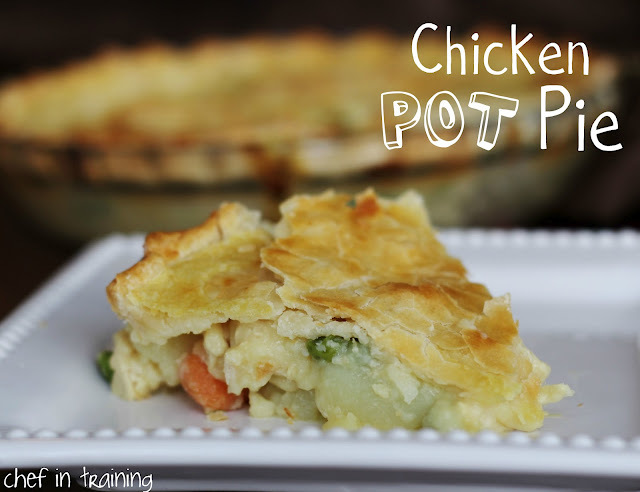 This looks so good and although I've made chicken pot pie in the past, they not been successful. I came over from The Answer is Chocolate. Just so you know. Last night I asked my husband if he had any ideas for what he'd like for dinner this week. His answer, to my surprise, chicken pot pie without peas (he hates peas, strong word yes, but it's that bad). I have not made this yet, so I checked Chef in Training and sure enough, Nikki comes to the rescue, AGAIN! I plan to make this tonight, without peas of course. My husband will be happy as he loves comfort foods, and I am too b/c this recipe looks very simple and delicious. Thank you Nikki! Where did you get your pie stand?